When Flaneur mentioned that he had a sort-of relative (one of those people who’s not technically a relative but is more easily described as one) who worked at Morandi in the West Village I took it as a sign that it was where we should go. I figured it had two things working strongly in its favor: one, it was a Keith McNally restaurant and since everything he opens turns to restaurant gold it had to be good and two, no self-respecting Italian could possibly work at an Italian restaurant in America that wasn’t good, right? And as it always gives me great pleasure to say this: I was right. The restaurant itself was rustic-casual with a lively, fun atmosphere and upbeat jazz pouring from the speakers and mixing with the chatter and clinking of dishes and glasses. The menu had lots to choose from and even several things that I hadn’t seen in months on any other menus. One of the specific things I’ve been nostalgic for recently are fried artichokes so when I saw them on the menu I didn’t even think of starting off with anything else. 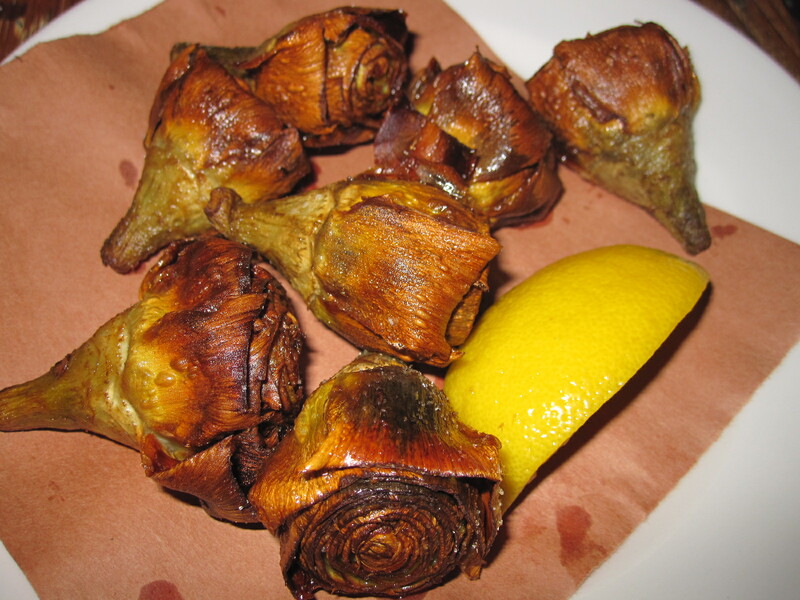 I love most things that are fried but artichokes are some of my favorite and these did not disappoint. Fried to a nice warm brown, and sprinkled with a bit of lemon juice, they were light and crispy with an almost buttery after taste. Flaneur got the burrata, which I was happy about because that would’ve been my go-to appetizer had the artichokes been missing from the menu. 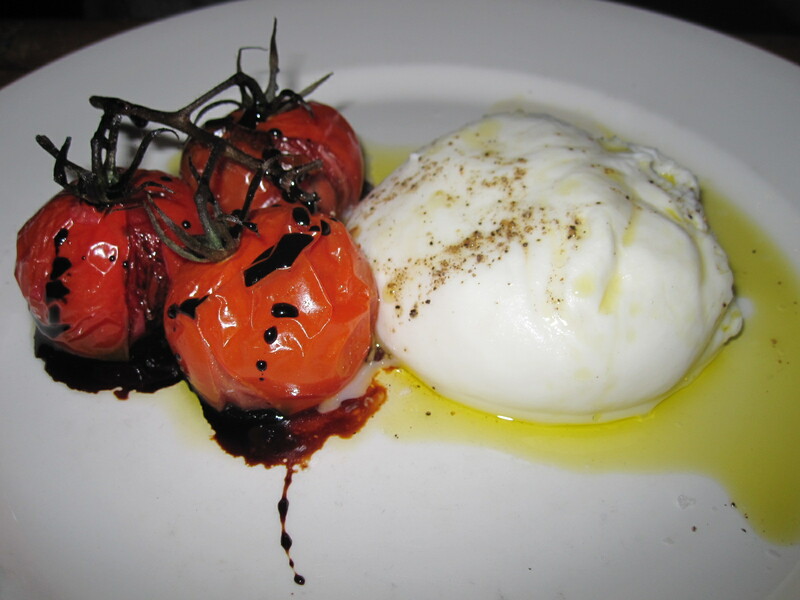 The creamy white ball of cheese came with three roasted cherry tomatoes and a drizzle of olive oil and balsamic vinegar, all of which quickly disappeared from the plate. For the entrée, I knew I wanted pasta. 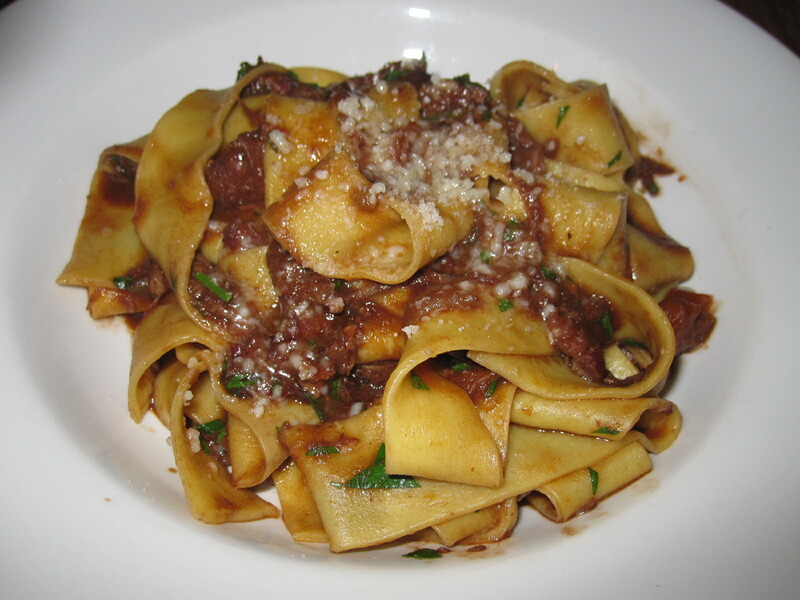 If a place can’t do pasta right then it shouldn’t have the claim to italian food, so I went with another one of my old favorites from when I lived abroad: pappardelle al cinghiale. The long, ribbon-like noodles and rich, meaty wild boar chunks were delicious, just as good as some of the best I’d had in Florence. With each forkful of the pasta and soft, juicy boar, I felt like I was catching up with an old friend. 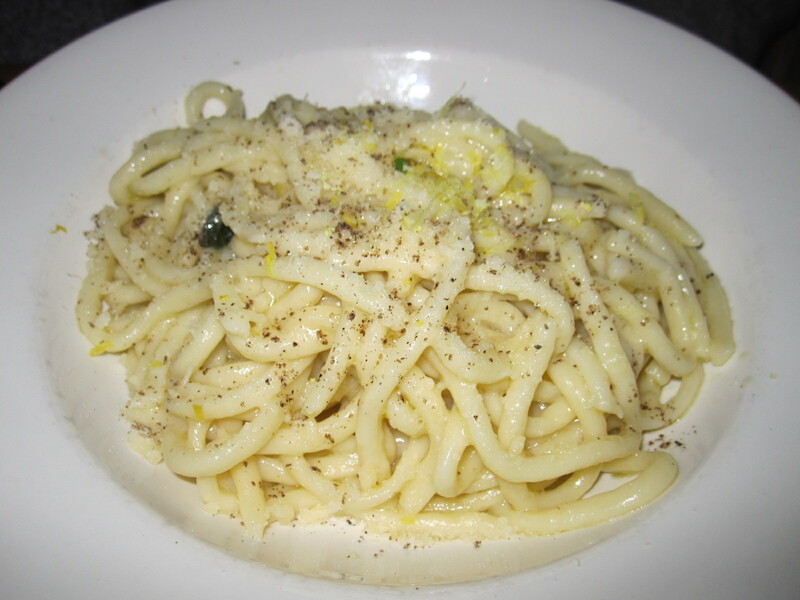 Although he thought about getting a second course (meat or fish), Flaneur took my route and went with a pasta dish: pici al limone. I was ready to be critical of these because pici (especially the ones I’ve eaten in Siena) are some of my most beloved noodles, but these left no room for skepticism or complaint. Simple and delicious, like the best italian pastas usually are, the thick, round spaghetti-like noodles were both tangy and cheesy under their blanket of parmesan cheese and lemon. As usual though, it was going to take the desserts to really seal the deal with me and steal my heart, and Morandi, with its dessert menu of vin santo and cantucci, budino di riso and other sweet treats, had pretty much won me over. I went with the frittelle di ricotta and sure enough, they were the perfect way to end the meal. 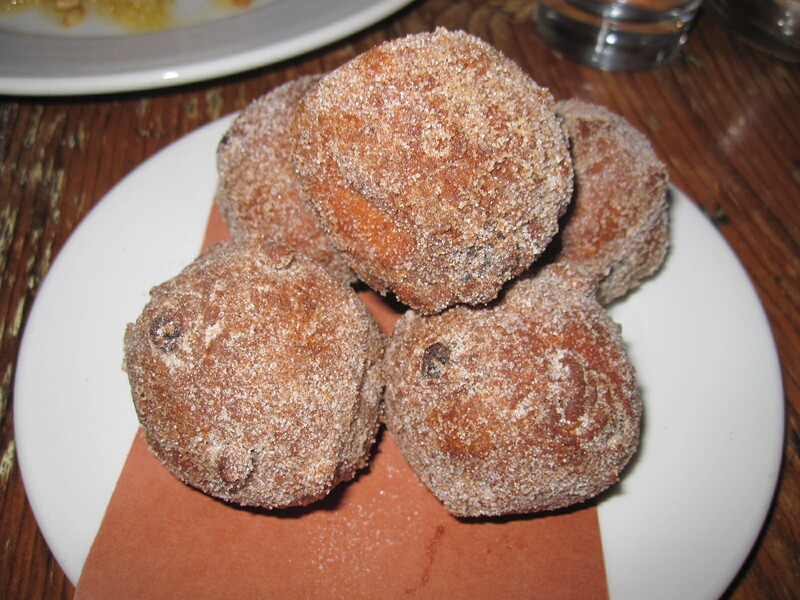 The five golfball sized ricotta fritters dusted in sparkly brown cinnamon sugar were soft and warm, with moist, fluffy insides like little clouds of sugary perfection. 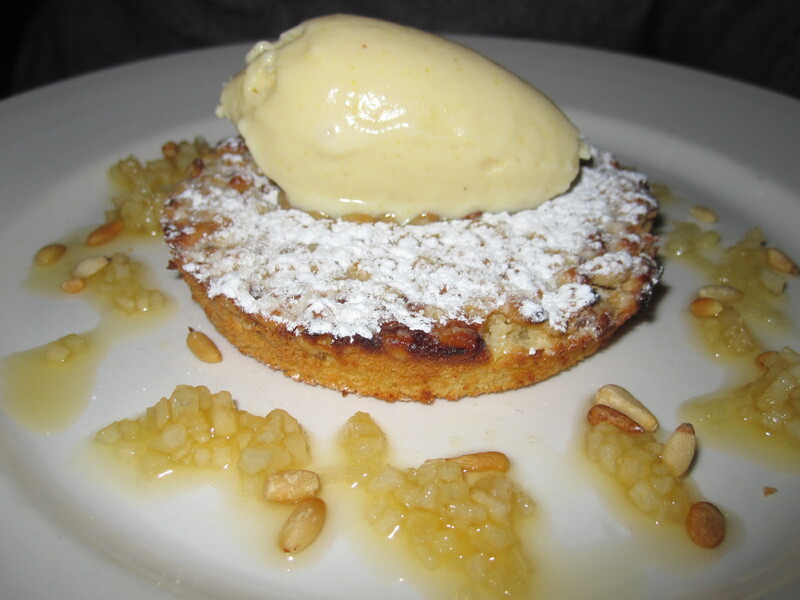 Finally, because he loves pine nuts (and even kind of has a pinolo shaped head), Flaneur opted for the crostata di pinoli, a moist pine nut tart under a snowy layer of confectioner’s sugar, surrounded by a drizzle of spiced honey and topped with a dollop of creamy pear gelato (which was also, for the sake of continuity, shaped like a pine nut). The whole thing was subtle and light, with the gelato giving the warm cake below a nice cool creaminess. So until I get a nice chunk of time and a great deal on a transatlantic flight, I think I’ve figured out the cure to the missing-Italy blues. And based on my dinner at Morandi, I have to say, it seems to do the trick.